UK - Hall Stage offers a range of specialist curtain tracks for every application. 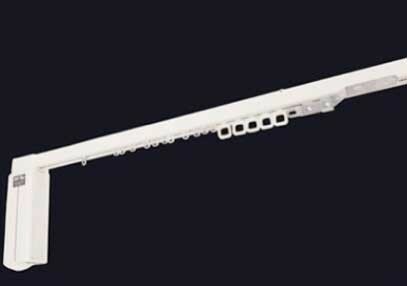 The highly versatile T250 and T300 tracks are manufactured from continuously extruded aluminium, finished in white and supplied with self-lubricating nylon sliders, making them an attractive and virtually silent option for small to medium sized applications. Hall Stage T250 Track is a walk along or hand line operated curtain system suitable for light or medium weight curtains. Designed for mid-sized applications, T250 can be curved and bent to a minimum radius of 250mm. The elegant rounded profile remains unobtrusive when installed with its proprietary fixing clamps. Control side and cord drops can be altered on site with relative ease making the T250 elegant and uniquely versatile. 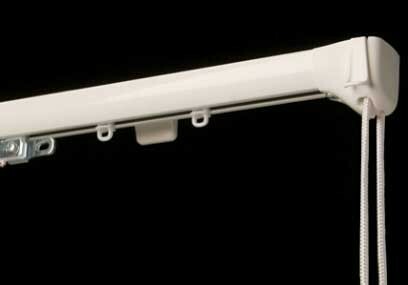 T300 is a powerful low voltage (24V) electrically operated curtain track system. It is supplied tested and assembled and completely ready to install with infrared remote control as standard. The track is suitable for both 110 and 240 Volt supply, and it can be installed without the need of an electrician. T300 track can also be supplied curved to meet any configuration required.